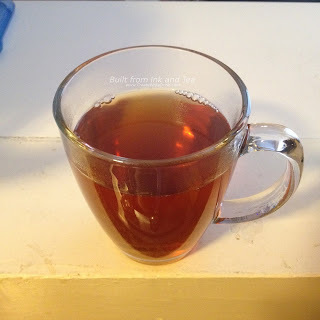 This week's tea for review comes from DavidsTea and has a lot going on (much like many of us, as we approach the end of the year). In the title of this post, I classified The Skinny as an oolong, and yet this tea blends oolong with pu'erh tea, plus adds ginger, orange peel, and eleuthero root (a known stress-reliever). If that sounds like it might be a bit intense - it is. My first smell of this tea shocked my nose at the strength. Especially due to the ginger, the tea gives off strong spicy and earthy tones. The pu'erh certainly contributes to this aroma. 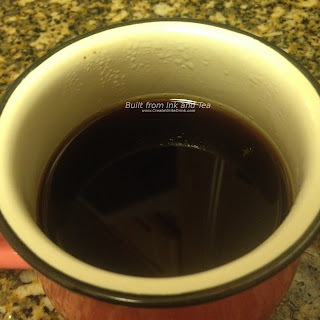 Once brewed, the cup has an earthy smell, still, but I can also smell notes of something slightly-sweet (perhaps the ginger, toned-down slightly) and herbal (likely the eleuthero root, not a scent I have encountered before). DavidsTea recommends one and a quarter teaspoons per cup, steeped for four to seven minutes. Since I was making four cups, I used five teaspoons, then chose to brew a stronger tea and steeped the leaves for six minutes. The water used should be at an ideal temperature for oolong teas, just short of boiling. Steeping the tea for six minutes resulted in a dark cup, which looks strong to me (just as I wanted). The aromas, though, are not overpowering. The first sip brings a flood of flavor. Six minutes seems really ideal to me, as I can clearly taste the ginger (without it being too powerful), the citrus (from the orange peel, not too bitter), the eleuthero root (or what I assume is that flavor)...and a bit of tea? As I continue to sip, I enjoy the flavors, but I wish I could taste more of the tea itself. The pu'erh is noticeable, especially in the aftertaste, due to its earthiness. However, the oolong, except for a few roasted notes, seems overpowered/overshadowed by the other flavors. On my personal enjoyment scale, I would rate this tea a 3. I appreciate what DavidsTea tried to do here, combining oolong and pu'erh, and I really like the pu'erh plus ginger mixture. However, I think that the tea blend lacks balance, unless the intention is to not showcase the tea itself. DavidsTea's The Skinny is available from their website, here. As I sat in my kitchen, drinking tea, this afternoon, I suddenly had a realization. The cup in my hand contained one of my most favorite teas of all time, and I am not lightly giving a tea that label. Truly, this is one of the very few teas that has remained a constant in my evolving tea tastes, ever since I first discovered it. Not only the aroma and flavor, but also the strength, the versatility, and the value, drew me to drink it over and over again. Further in my realization was that I have never introduced or featured the tea shop from which this pu'erh comes. And yes, it is a pu'erh, my most favorite of tea varieties - and a shou pu'erh at that! Looking back in my archives, I found that I have once made mention of the company in a post about oatmeal (here) and once tagged them in a post on anti-decanting (here). My deepest apologies go out to them for not at all doing them justice and giving them the coverage they very much deserve. Vital Tea Leaf is my favorite tea shop in the world. From the moment I first stepped foot inside their doors on July 24, 2010, they have been held dear to my heart. Nowhere else have I found a place so friendly and willing to share, to teach, and to guide the experience of tea. Their tea selection is one of the largest I have ever seen. Certainly, one could find websites that sell more different teas, but Vital Leaf (as they are sometimes called) has them all in-store and available to try. And no, I do not mean just to smell (though smells are free, too); I mean that they will happily brew you a sample of any of their teas, so that you can know exactly what you are buying. Vital Leaf primarily offers three different loose leaf pu'erh (though they have many cakes, too). Wood Bridge is about eight years old, Supreme Yunnan has been aged around twelve years, and Royal is fifteen. Today, though, we are going to talk about Supreme Yunnan. I have already hyped it a lot, so I am going to brew a cup. Supreme Yunnan brews very well using a gaiwan and short, frequent infusions, but it has the versatility to be steeped in more of a Western style, too. 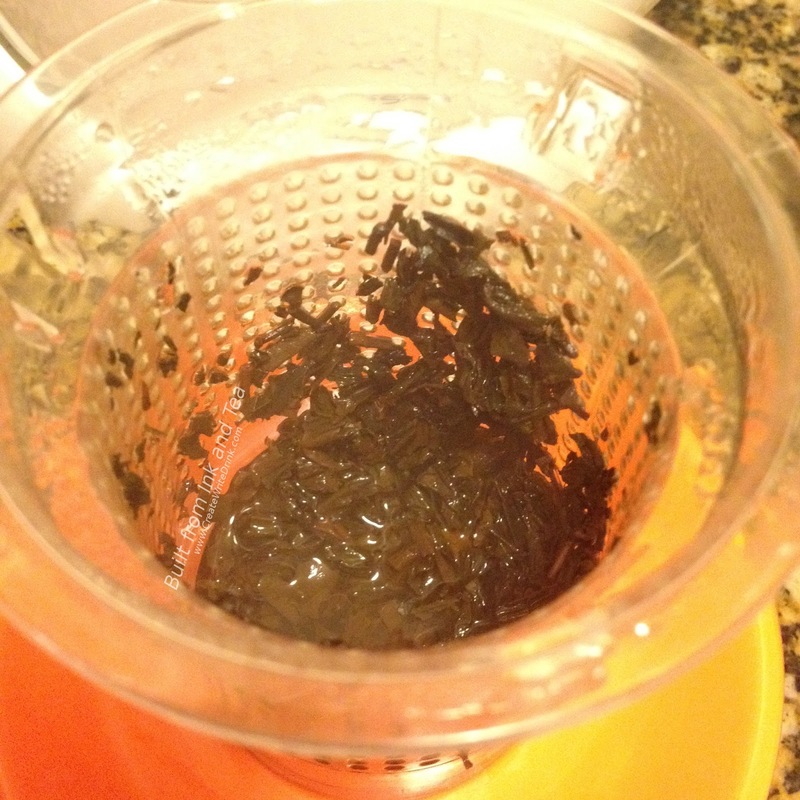 Pu'erh steeping is not a precise science, but I use about two teaspoons of loose leaf in my five ounce gaiwan. 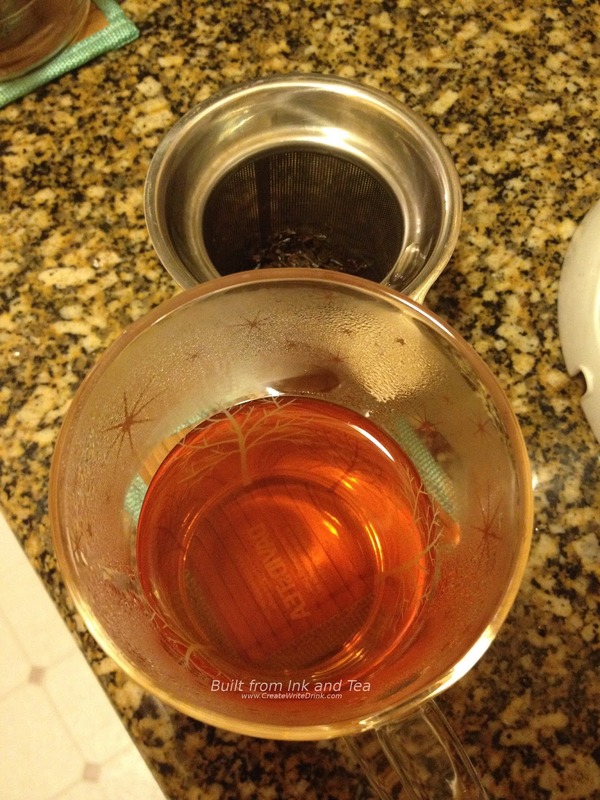 Since we are steeping the tea multiple times, future infusions can be varied in time to adjust the strength. 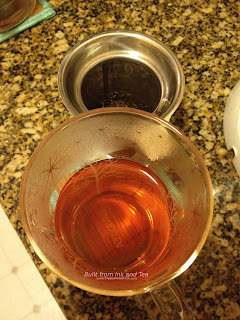 Plus, I have found that every infusion reveals just a bit more about the tea, varying flavors and aromas slightly in an evolution that is usually only found with pu'erh. 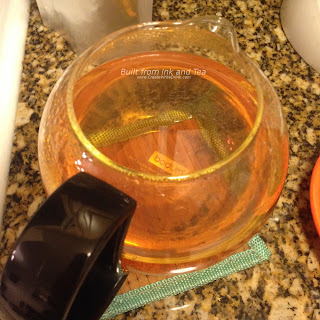 The water I use has been boiled and let cool for a minute or two, but I have also used just-boiled water to brew Supreme Yunnan without any adverse effects. 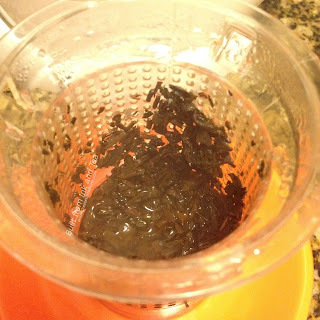 After rinsing the leaves (a quick steep, where I pour the water over the leaves and immediately empty the liquid from the gaiwan), I start with a twenty or thirty second infusion. Like I said, the timing is not precise, and one tends to gain a "feel" for each pu'erh and the optimal times, based on aroma, color, and how the previous infusion was. Supreme Yunnan smells dark. To me, the aroma holds the scent of wet leaves and damp earth, along with slightly lighter notes of something dry, almost sharp, but not unpleasant. I find the smell hard to describe, but it draws me in, making me want to keep breathing the aroma, whether of the cup, the dry leaf, or the wet leaves in my gaiwan. 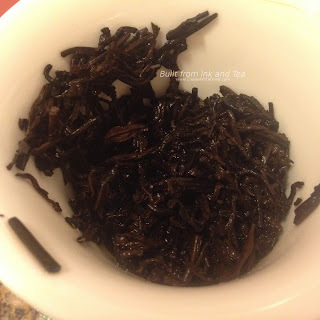 Due to its age, Supreme Yunnan is not the smoothest shou pu'erh I have ever tasted. I am okay with that, and I actually love that aspect of this tea. This pu'erh has a strong earthiness that I have rarely found in other pu'erh of similar prices. The roughness in the flavor is not a bad thing, and there is still plenty of silken texture throughout the body of the tea. "Hearty" might be a good description for the feel I get from drinking this tea. That sounds weird, but the combination of flavors lends itself to something along those lines. A sip starts soft, seeping over the tongue. Then, still in the main body, the earthiness presents itself, a little rough around the edges. Deep mushroom notes appear and round the flavor. The aftertaste feels a lot like the body, albeit with a touch of smokiness. I wonder, if I did not notice that slight smokey flavor in the cup, or if it only came forth as a part of the aftertaste. On my personal enjoyment scale, I would absolutely rate Supreme Yunnan a 5. I have no doubt that I will keep buying it for years to come. 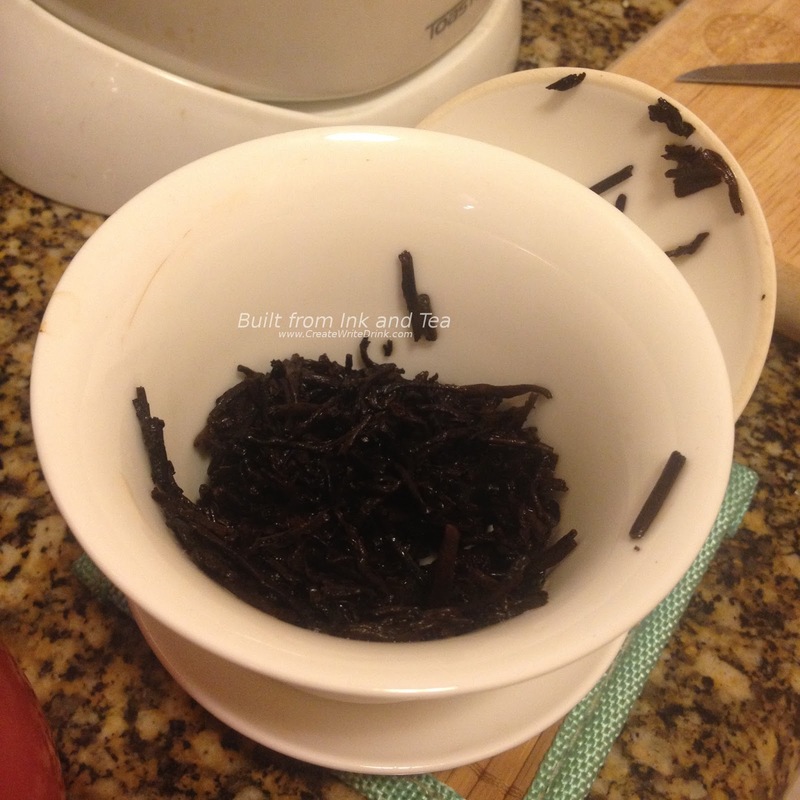 The price point makes it very accessible and an excellent value for a pu'erh of its quality. I highly recommend trying it, and - if you have the chance - I recommend visiting Vital Tea Leaf in San Francisco, California. Let them show you all the magic of tea that they have to offer. Vital Tea Leaf's Supreme Yunnan Pu'erh is available from their website, here and in Vital Tea Leaf stores. I have no idea how it took me so long (from the acquisition of this sample) to review another Earl Grey blend. 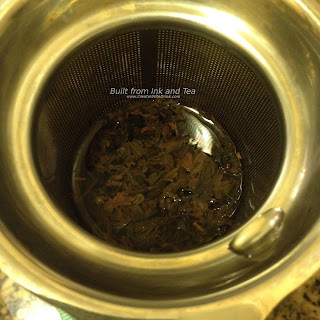 Sometimes I think I should just transition Built from Ink and Tea to reviewing only Earl Grey blends and pu'erh. But, there are so many other good teas in the world! Today's Earl Grey comes from Upton Tea Imports. Season's Pick Earl Grey Crème Vanilla is, as you might have guessed, a cream Earl Grey, taking the standard Earl Grey flavors and adding smooth vanilla notes that tend to tone-down the cup, while adding an extra layer to the flavor. I brewed two teaspoons in two cups of just-boiled water for four minutes, and the resulting cup smelled great! The aroma of vanilla hit my nose before anything else. Even as I began to smell the bergamot and some of the underlying black tea, the vanilla still came-on strong. It has an intensity to it that reminds me a bit of vanilla extract in its depth. The bergamot smells light and nearly gets overshadowed by the cream aromas. The black tea, too, has taken a major backseat in the aroma to the vanilla and citrus, being even less prominent than them. The first sip of this tea changed my entire perception of the cup. I was fully expecting that, given the intensity of the vanilla aromas, the flavors would be dominated by them, but that was far from the case. 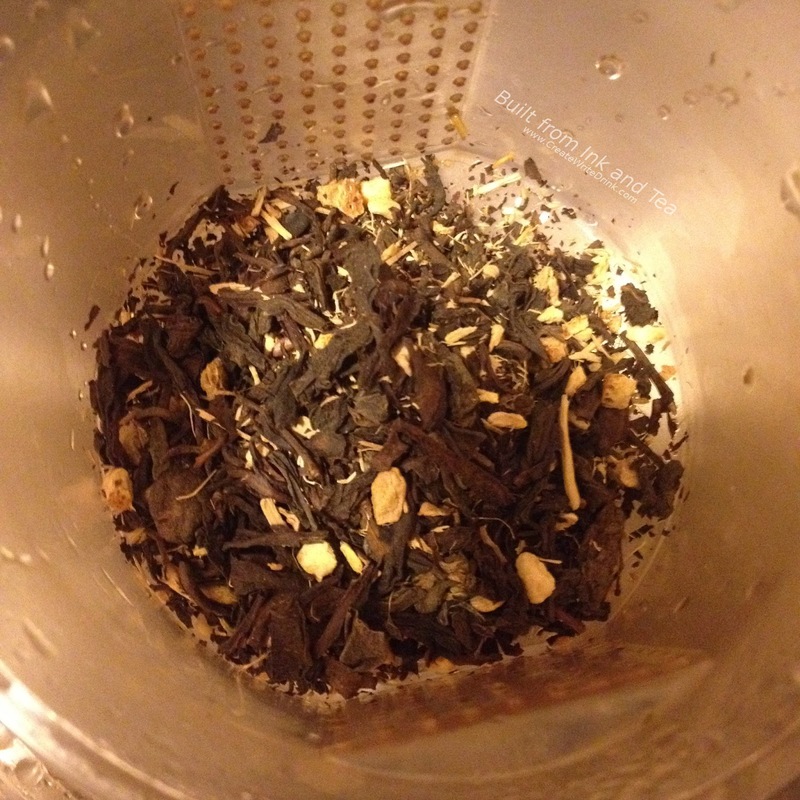 The tea did taste quite strongly of the vanilla and cream flavors that contribute to its name. But the bergamot shone through those smooth notes, as if to say "Look at me, I am an Earl Grey blend!" Subsequent sips revealed a slight difficulty in tasting the other flavors through the cream ones. The other flavors did show themselves, but sometimes I had to let the tea linger on my tongue for a few moments, before I could really begin to taste and identify them. Overall, I felt that Upton Tea Imports' Season's Pick Earl Grey Crème Vanilla had great taste and an enticing aroma. However, it really embodied the cream side of a cream Earl Grey, so I would not describe the flavors and aroma as balanced by any means. This may in fact appeal to some folks, who want more of a vanilla-flavored tea with some citrus notes. On my personal enjoyment scale, I would rate this tea a 3. Upton Tea Imports' Season's Pick Earl Grey Crème Vanilla Black Tea is available from their website, here. Welcome to December! This week, I wanted to provide a contrast - potentially a sharp one - with the tea that we reviewed last week, Whispering Pines Tea's Wild Grey. With Wild Grey being described very specifically as a "very lightly flavored" Earl Grey blend (a statement that proved very true in the drinking), I decided that the ideal contrast wold be a tea that takes this bergamot and black tea combination to the next level of intensity. There was no subtlety here: The Republic of Tea's Earl Greyer. In an attempt to produce "the best tasting Earl Grey available", The Republic of Tea has blended their bergamot oil with a base of Ceylon black tea. While this might sound standard for Earl Grey, they have tried to use the best ingredients available - and up the ante on the bergamot oil. The loose leaf has a kick to it! Higher intensity on the aroma, though, does not necessarily translate to higher intensity on the flavor, as we found last week. Steeping a teaspoon of tea for four minutes in eight ounces of just-boiled water produced the cup that is going to reveal all! 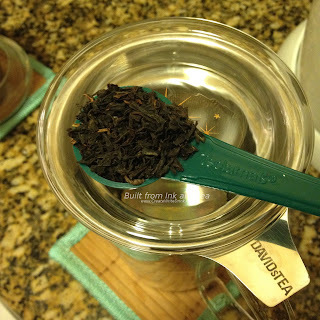 The bergamot aromas in this blend smell strongly enough that the underlying tea has been unfortunately hidden. While I typically do not mind the base tea in an Earl Grey blend being subdued or hidden, given that I drink it for the blend of bergamot with tea flavor, I was curious to gain an understanding of the profile to be expected with the Ceylon used in The Republic of Tea's Earl Greyer. The steeped cup gave off a most intense smell of bergamot, which seemed heavy, dark, biting, and strong. In some respects, the citrus aroma reminded me of a malty, strongly-steeped black tea, almost like an Assam. While this might sound like a bad thing, it did not feel negative in this instance. In sipping this tea for the first time, the bergamot surprisingly does not overwhelm me nor the flavor of the tea. Certainly, it does taste very strong, but it blends well with the Ceylon, which is now noticeable. I find the bergamot in this blend to be very robust and full in flavor, expansive rather than overpowering. It encompasses the whole of the cup, as if to remind you that "Yes, this IS an Earl Grey blend that you are drinking." Overall, it is a fairly pleasant effect and certainly not common. The tea finishes with an aftertaste reminiscent of the cup itself, flavors of black tea and bergamot oil lingering in the throat. For the contrast we got from this week's tea and last week's tea, I never sensed competition. Instead, these two teas cater to two different groups of Earl Grey drinkers: those that prefer a lot of bergamot and those that prefer a little. For the Venn Diagram-like overlap between these groups, comprised of folks who simply love Earl Grey, these two teas will be treats. But as it regards The Republic Tea's Earl Greyer, I would rate it a 5 on my personal enjoyment scale. Prepare yourself for the experience with this one - and enjoy. 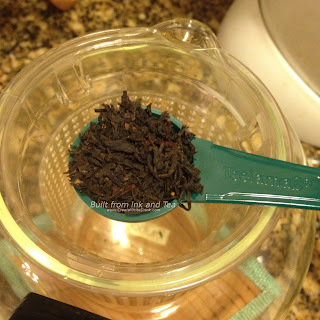 Republic of Tea's Earl Greyer Black Tea is available in bags from their website, here and in loose leaf from their website, here.